Here’s what’s up in the world of TV for Wednesday, January 2. All times are Eastern. 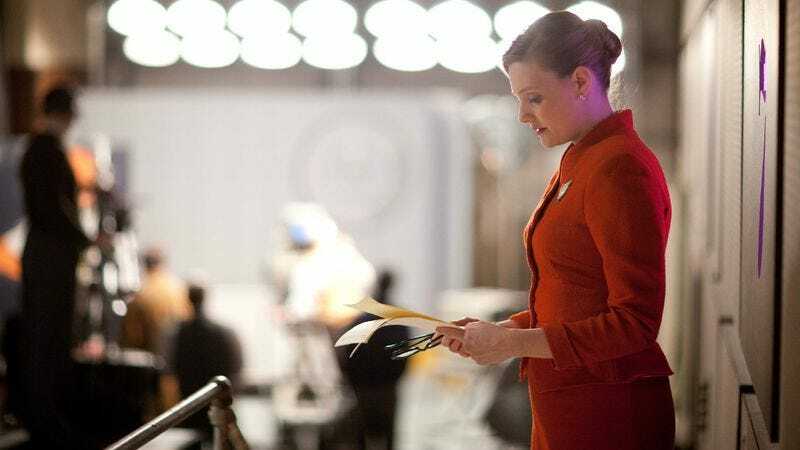 The Hour (BBC America, 9 p.m.): Do you smell that in the air? That’s the scent of freshly chopped new TV shows burning in a grove. NBC and Fox are all new tonight, while numerous cable channels will also have new programming. Meanwhile, The Hour, which so valiantly held its own during two of the least-watched weeks of the year, finishes out its second season tonight. Will Bel, Freddie, and Hector expose the evil goings-on at El Paradis? Will Romola Garai wear glasses again? Will Ben Whishaw regrow that beard? Will Todd VanDerWerff’s heart ever stop going pitter-pat for those two? Only time will tell! American Horror Story (FX, 10 p.m.): Did you know TV’s favorite batshit horror drama is back tonight? Because we? Did not, even though when we thought about it, airing tonight was the only way to clear out space for The Americans in time. Todd VanDerWerff is grudgingly going to watch his screener now. Top Chef (Bravo, 10 p.m.): We’re so happy that Top Chef has come to Seattle, and we have a list of other cities the show should hang out in in future seasons: Ulan Bator; San Diego; Door County, Wisc. ; Bozeman, Mont. ; Aberdeen, S.D. Emily Withrow knows only some of those are serious. The Wife He Met Online (Lifetime Movie Network, 8 p.m.): Okay, yes, we probably shouldn’t pick two cheesy Lifetime movies in a row, but this movie’s about a guy meeting a woman online, only to find out she’s completely messed up. Honestly, Lifetime Movie Network? Did you just port in from 1997? Nova (PBS, 9 p.m.): If you’ve been thinking about how you managed to escape that whole “Mayan calendar apocalypse” thing—which we’ve been hearing about since the ‘80s—unscathed, well, PBS is here to put fear of an Icelandic supervolano doomsday into you. Get used to it! You’ll be hearing it a lot! Sweepstakers (OWN, 10 p.m.): Frantically throwing things at the wall in an attempt to not be the one huge flop on Oprah Winfrey’s resume (give or take a film adaptation of Beloved), OWN is now just turning into TLC-lite, as this show about women pursuing “sweepstakes offers” demonstrates. Amores Perros (Sundance, 8 p.m.): On the one hand, we could be thankful for this film, which was one of the initial heralds in the great boom of Latin American cinema of the last decade. On the other hand, we could be sad Alejandro Gonzalez Inarritu followed it up with 21 Grams, Babel, and, ugh, Biutiful. Laugh, Clown, Laugh (TCM, 8 p.m.): We have no idea if this silent film is any good, but it stars Lon Chaney, and its title is somebody commanding a clown to laugh, so that’s all going to be good enough for us. Also, it’s about an elderly clown who falls in love with a teenage orphan, so family values. Sugar Bowl: Florida vs. Louisville (ESPN, 7 p.m.): The Gators chase their fifth-straight bowl win against the Cardinals, who are coached by a former Florida assistant. Louisville’s strong offense is led by Teddy Bridgewater, but Florida’s defense is stifling. How’s that for a college football capsule, ungrateful jerks? The Sisterhood (Tuesday): Sonia Saraiya takes a look at TLC’s weirdly controversial new show about preacher’s wives living in Atlanta and wonders what all the fuss is about. Meanwhile, your faithful What’s On Tonight correspondent is grateful to turn things back over to Erik Adams tomorrow. See ya!